Lee Scott is a highly valued member of the Redmond Group family. He has grown within his role, and – through his instinct and drive to learn and apply knowledge – expanded it. He’s become our ‘IT Guru’, and systems ‘Super User’, as well as knowing the often subtle technical differences to be considered when purchasing and sourcing products. He has helped with training other colleagues, and is often the ‘go-to’ person for a variety of issues in the office. He makes an important and positive impact on our work and our team on a regular basis. 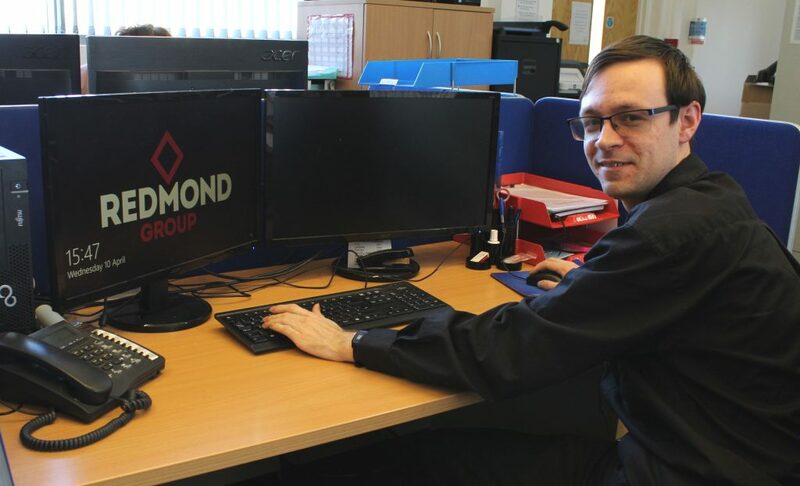 “I have been working for Redmond Group for nearly four years now, my background is E-Commerce, so I am used to learning about products and processing data, however I specialise in IT Implementation and Support. Originally, I started off as the Buyer, gaining knowledge of mechanical fittings, negotiating with suppliers, streamlining company documentation, and additionally providing impromptu IT support when needed. As Redmond Group has grown, we have grown as a team that continues to work well together. We share and teach skills for better integration; having multiskilled employees in the office allows much better flexibility and time management. My knowledge on most areas of the business has allowed me to better understand the company’s needs, learn more about the systems and software, and develop our IT systems to suit growth and expansion. I love knowing that the work I do helps others to work more efficiency.